FlashVent TPO/PVC Square Top Roof Vent. 10x10 Square metal White Top, 8-5/8" ID, 20x20 inch base of weldable TPO or PVC. Body/Frame/Top are Galvanized Steel. Includes Bug Screen. Price/Each. A low profile (7.5" overall) TPO or PVC Weldable Vent with Cover for 7" nominal (or smaller) Vent Pipes. 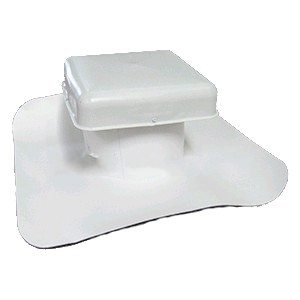 Used on TPO or PVC Roofs to Flash and Seal vent penetrations. Quality construction makes installation quick and easy. Fits: up to 8" Nominal metal vent pipes. Inside Diameter: about 8-5/8" ID x 6-1/2" high. Top: 10 x 10 x 2-3/8" white-painted galvanized steel with Inside Bug Screen. Top is removeable for service. 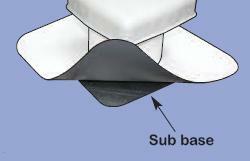 Weldable Flange: 20 x 20" with 3" wide TPO or PVC weldable base flashing. Net Free Vent Area: 30 Sq.In.